TechnoServe's interactive trainings in cocoa cultivation are helping thousands of farmers in Peru boost their yields and their incomes. 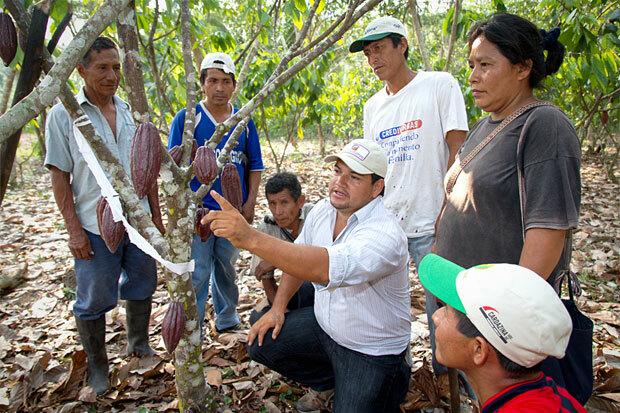 A group of farmers gather at a demonstration plot in Las Mercedes, Peru, as TechnoServe advisor Nixon Rojas Sandoval demonstrates best practices for fertilizing and pruning cocoa trees. As part of an interactive training, the farmers will then replicate the practices across the rest of the demonstration plot. TechnoServe organizes these training sessions for groups of 20 to 25 cocoa producers across Peru’s San Martín region. Local technical advisors like Nixon, who have been coached by TechnoServe staff on both farming techniques and adult training, deliver the comprehensive curriculum. Other trainings in the curriculum focus on topics such as water and soil conservation and disease control practices. As the season progresses, farmers see firsthand how the new practices result in healthier, more productive trees. With support from the U.S. Agency for International Development, TechnoServe has established 300 demonstration plots and trained more than 6,500 cocoa farmers in production techniques. Learn more about our work to promote a sustainable cocoa industry in San Martín.